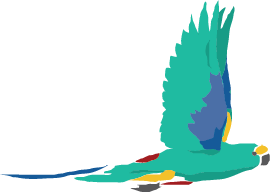 We would like to introduce you to Bill, the colourful bird you see in Mulga Bicycle Tours’ logo. Bill is a Mulga Parrot and native to inland Australia. The Mulga Parrot (Psephotus varius) flies in pairs or small groups, just like you will on our tours. The parrot takes its common name from mulga (Acacia aneura), the shrubby trees that are ubiquitous in outback Australia, and where these birds make their home. But mulga is much more in the Australian consciousness – the name comes from the aboriginal Yuwaalaraay language spoken near Lightening Ridge, and mulga wood was a vital resource for indigenous Australians. Since European settlement, the outback’s vast mulga landscapes have made their way into our art and mythology, and the term ‘mulga’ has come to signify the outback itself. Mulga Bill’s Bicycle, by Banjo Patterson, is one Australia’s best-known bush ballads. Written in 1896, when drought made horse feed too expensive and bicycles became very common in outback Australia, the humorous poem tells the story of Mulga Bill, whose ego does not match his true riding abilities, and who, after a wild ride, abandons his shiny new bicycle in a creek. Needless to say our own cycling experiences have been vastly different from Mulga Bill’s – one of the most positive side-effects of bicycle touring is the wonders it does for one’s self confidence, and mental and physical wellbeing. Something the team at Mulga Bicycle Tours are looking forward to sharing with you.